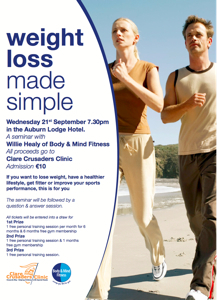 A Seminar with Willie Healy of Body & Mind Fitness. All Proceeds Go To Clare Crusaders Clinic. If you want to lose weight, have a healthier lifestyle, get fitter or improve your sports performance, this is for you. Admission: €10. Tickets can be purchased and donations made at Mycharity.ie or by contacting Willie Healy on 086 1670132. The subject of this seminar is based on my wish to clear up some of the confusion that seems to surround Weight Loss in general and Body Fat reduction in particular. I’ve lost count of the numbers of times that I’ve had nutrition consultations with clients who thought that they were doing “everything right” and yet were still a long way off their ideal weight. In these cases, the clients were very motivated but unfortunately were mis-informed. On other occasions I’ve consulted with people who “knew” that their lifestyle was unhealthy, but felt unable to improve it by making better food or exercise choices. In these cases, lack of motivation was the obvious problem. In the Weight Loss Made Simple Seminar, I will show the Diet, Exercise and Lifestyle strategies that have worked for me and my clients over the past 10 years that I’ve been in the Health & Fitness industry. All of these methods are backed by scientific research, but more importantly, they work in the real world, and can be applied immediately. I will also show ways that you can increase your motivation and make it last a lot longer than the average New Year’s Resolution! So if you’re interested in reducing your body fat, increasing your fitness and/or athletic performance or if you simply wish to be healthier, then this is the seminar for you. The seminar will be followed by a question & answer session. 1 free personal training session.